designed for businesses seeking robust unified communication features without having to own or maintain an office phone system, organizations are attracted to the flexibility of paying a recurring monthly service fee based on size and usage. ACC’s 3CX Cloud Phone System provides you with the tools and features you need to enhance your business for improved growth and success. Utilize countless options to take your business to the next level with a wide variety of inherent features such as Voicemail to Email, Voicemail to Text Transcription, Web and Video Conferencing, Mobile Apps, Inbuilt Failover, and more. Provide your valuable customers with quality assurance by utilizing our full-blown Contact Center, Call Recording, and Automatic Distribution (ACD) software. Managers will appreciate the detailed statistical reports on activity and performance for each agent or per queue, and the ability to access wallboard statistics from softphones and web clients. 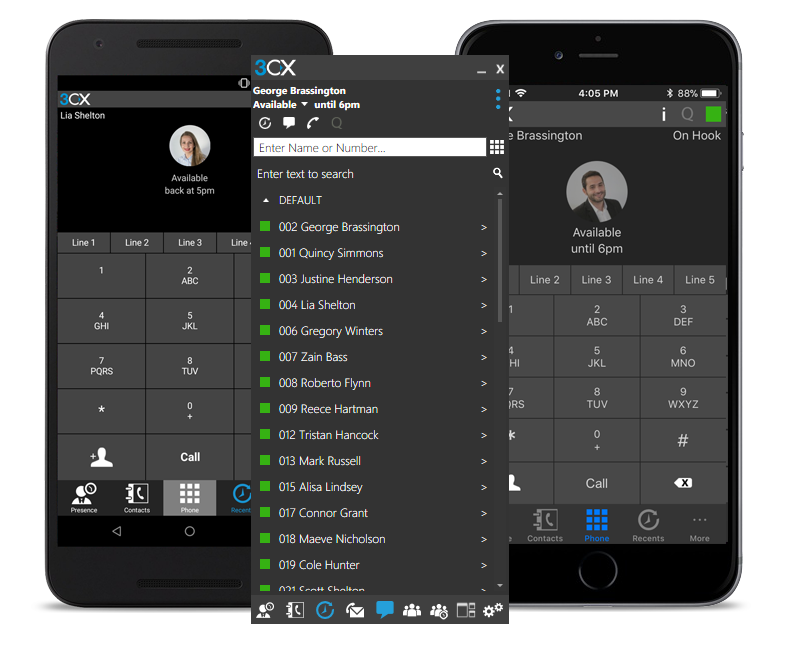 3CX Cloud PBX Mobile Apps for iPhone & Android. ACC’s 3CX Cloud Telephone System allows you to be in the driver’s seat when it involves your business phone choices. 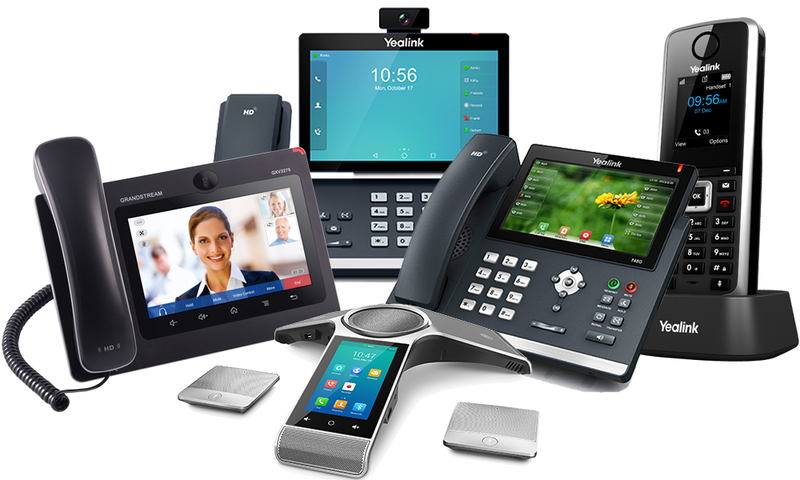 Say goodbye to traditional systems with proprietary phones and hello to IP phone freedom! state-of-the-art business management phone system applications such as web conferencing, voicemail, voicemail-to-email, Auto Attendant, an online admin management portal, choice of (4) different mobile clients for each user, call park/unpark, chat, presence, and so much more for one low monthly cost per user. *101+ users please contact us for special pricing. View our complete feature list here. Say goodbye to high maintenance cost and expensive software updates. With 3CX Cloud PBX, admin maintenance is reduced to almost nothing and software updates are included for free. 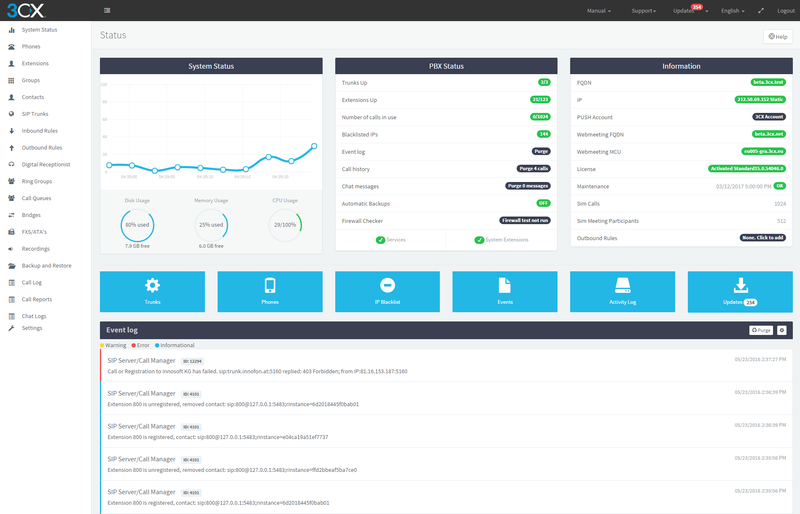 The newly designed Administrator portal provides complete PBX monitoring with real-time PBX health status updates on SIP Trunks, blacklisted IPs, and critical system events. Built with automation and intuitive design in mind, 3CX coined the term “zero-admin PBX”– and wow, did they deliver! 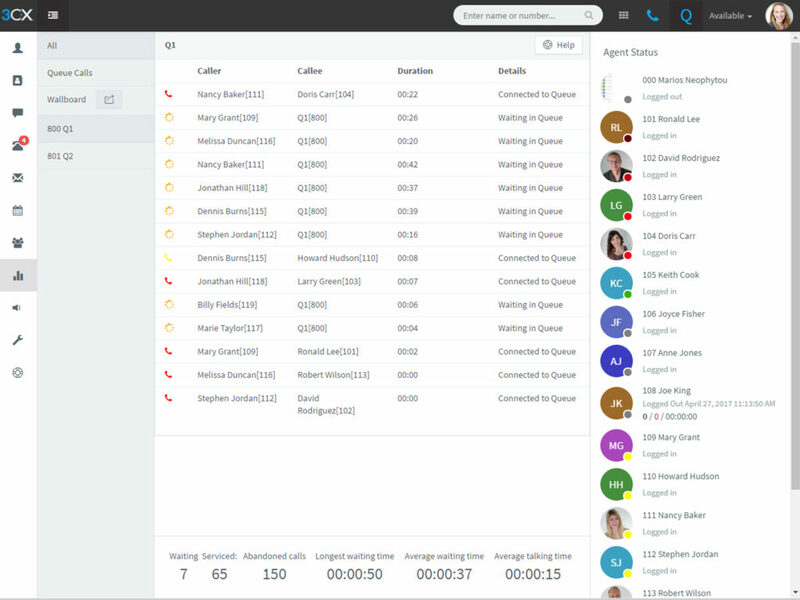 3CX Cloud PBX management console eliminates complicated updates to users’ extensions, ring groups, call queues and bridges– and makes it easy to access call recordings, call logs, and call reports instantly from the dashboard. button mapping and more. 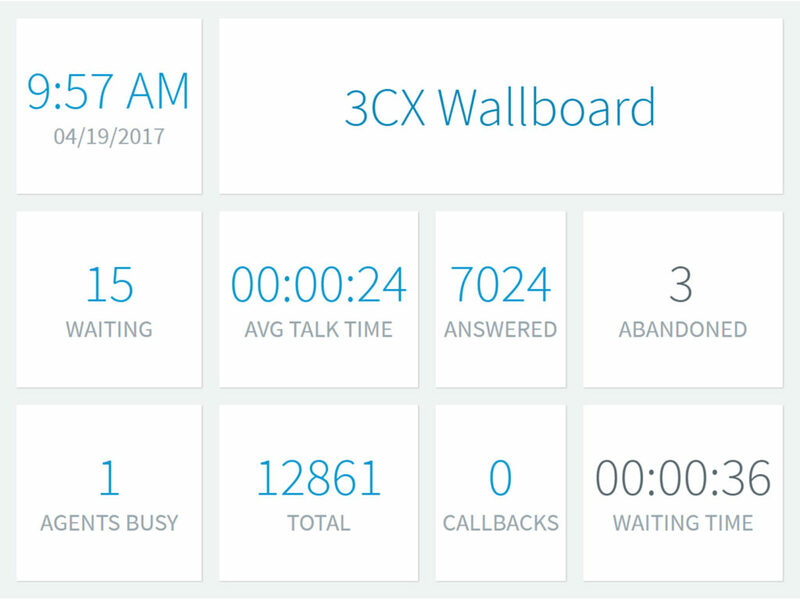 3CX Cloud PBX system users can customize their own softphones, web clients, and desk phones with busy lamp fields/extension mapping, avatars, emojis, and background themes–and believe us, this is a system that they’ll be excited to use! software delivers enterprise-grade features at a very low per-user cost including but not limited to Call Back in Queue (CBIQ), 50+ advanced reports, and CRM integration with screen pops, click-to-call, and call journaling. With ACC’s inbuilt failover and geo-redundant Voice over IP phone service, you’ll never have to worry about your Call Center going down again. Q: What separates ACC cloud communications from the competition? Not all cloud telephone systems are created equally. Our geo-redundant platform includes carrier-grade failover technology with multiple data centers. Be sure to ask if your cloud provider is geo-redundant! Q: Is there a difference between a Cloud, Hosted, or Virtual phone system? The industry coined the term 'Hosted PBX' since your VoIP provider "hosted" your phone system on your behalf in data centers. Today, the terminology has shifted to 'Cloud Phone System' or 'Virtual Phone System' since all of your PBX features, applications, and calling services are located "in the cloud." Q: I've read mixed reviews about cloud phone systems and VoIP phone service. How can you guarantee that I won't experience dropped calls, static and outages? Since VoIP calls are run over the public Internet, cloud phone systems and VoIP phone service are reliant on network stability and quality bandwidth. Performing a network assessment prior to installing a cloud phone system or SIP Trunking solution is the best way to avoid potential call quality issues. Q: What happens if I lose my Internet connection? All cloud-based applications rely on Internet connectivity; however, our Cloud PBX solution provides inherent and automatic disaster recovery so when you lose your broadband connection, your communications infrastructure remains available. In other words, your Internet connection is no longer a single point of failure. When your business phone system resides in the cloud, you're provided with a variety of call routing options. For example, our Virtual PBX includes features like automatic failover and geo-redundancy, voicemail to email and voicemail to text transcription, and all calls have the ability to be automatically forwarded and routed to virtually any person, device or location. Plus, we can architect a redundant broadband solution with multiple seamless Internet connections, cutting your costs. Q: Do I need a new or alternate Internet connection? You do not need a second Internet connection for business resiliency; however, a second Internet connection or MPLS is recommended, as it provides a great way to further solidify your network solution. Q: Is your VoIP platform secure against Call Hacking? Yes, our 3CX Hosted VoIP phone system technology has additional protocols in place to protect your VoIP account from PBX Fraud with real-time accounting monitoring & alerts. Additional safeguards include password-protected international calling and the ability to disable international calling completely. Q: Which Carrier does the platform utilize? The benefit of our 3CX Cloud Telephone System platform is that you'll never have to deal with a traditional, long distance carrier again. We manage all carrier connectivity in the cloud, with 'cross-connects' directly to the PSTN. Our platform includes connectivity to multiple carriers for redundancy purposes, so no single carrier issue will impact your business. Our carriers are chosen and maintain favor with us based on their reliability and costs. Q: Do you recommend performing a Network Assessment prior to installation? We absolutely recommend performing a network assessment prior to VoIP installation. ACC Telecom’s Advanced Network Assessment Tool focuses on TCP and UDP network topology to provide accurate and objective testing of voice quality on modern telephony networks such as IP. And since no two companies are the same, ACC Telecom’s VoIP Network Assessment is custom-tailored to fit your anticipated applications and usage. Our dedicated RiPi3 hardware and software collect data securely to analyze simulated voice traffic over your data network to measure key attributes that affect VoIP call quality including TCP bi-directional, UDP calling tests, UDP capacity, concurrent, simulated phone calls, network stability, delay, jitter, packet loss, Carrier HOPS, PING, End Mapping, and Traceroutes. Following the assessment, you will be presented with a report detailing the collected data with any suggestions to improve your network performance. A post-test assessment will also be performed following your VoIP installation. Q: Is your Cloud PBX System as feature rich as traditional PBX systems? Yes, our Cloud Phone System includes features most organizations could not afford with their existing phone system such as call recording, video & web conferencing, and main number business SMS capabilities. You now have the ability to manage these great features via our easy to use web management portal, with no expertise needed. 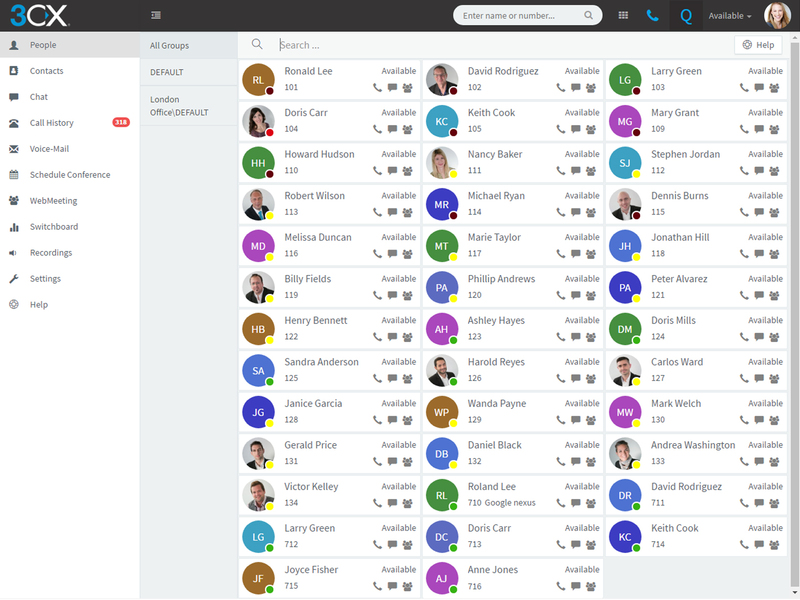 You'll be able to access carrier-class scalability, and CRM/API integration such as Salesforce.com, Outlook, and many more, providing you with a unified solution for all of your communication needs. Q: How does VoIP phone system costs differ from traditional phone systems? Data shows that businesses can save between 30-75% when moving to VoIP services. (Source) Our Hosted (Cloud-based) Phone System does not require large upfront investments like traditional phone systems. Switching to VoIP technology will reduce your operating costs upfront and over time by eliminating costs such as per-user licensing fees, on-going maintenance, software package, and simple Admin changes. This means your expenses are actually reduced! Our platform is continually updated to provide your business with new, enhanced capabilities and features- ensuring your business is always on the cutting edge of Virtual PBX technology! Please contact us to learn more about our 3CX Cloud Hosted Phone System for businesses or how you can try our 3CX Cloud PBX software for FREE. ACC Telecom is centrally located in Columbia, MD to conveniently support business phone systems throughout Maryland, Washington DC, Northern VA and beyond. 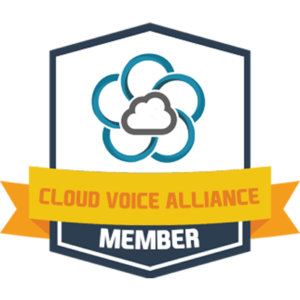 Our Cloud Voice Alliance partnership allows us to extend our footprint and serve businesses nationwide with the help of U.S.-based VoIP providers that share our same platform and carriers. You’ll always have local support in your corner with ACC Telecom and the Cloud Voice Alliance. Upgrading our telephone system came down to three components: the sales and install process, the reliability of new technology and the features and benefits of upgrading to a cloud system. ACC Telecom exceeded expectations at every turn. Their on-point sales process navigated us through the options, drilling down to the right solution for a 20+ phone, two location footprint. The conversion from our old system was a one day, stress-free process. The robust features of their cloud technology have not only been reliable, they’ve played an integral role in improved response times with our clients through a combination of incoming direct dialing, one-touch forwarding and state of the art delivery of messages through a variety of easily customizable text and email notifications. The bottom line… a perfect, game-changing telecommunications system for our business. "